Home Tags Posts tagged with "israel election"
Israel has begun voting in a general election, with polls suggesting Prime Minister Benjamin Netanyahu will return to office but with a reduced majority. Benjamin Netanyahu said the choice was between parties that would lead to “a divided and weak Israel or a united and strong Israel”. Analysts say he is likely to form a new right-wing coalition. Unlike previous elections, the Israeli-Palestinian peace process has not been high on most parties’ campaign agendas. Social and economic issues have emerged as key concerns among voters in the run-up to the polls. According to final opinion polls, the joint electoral list of Benjamin Netanyahu’s Likud party and the ultra-nationalist Yisrael Beitenu party of his former foreign minister Avigdor Lieberman will win about 32 seats. That would be 10 fewer than their combined total from the previous election but still enough to form a majority with right-wing parties. Other right-wing and religious parties are expected to give Benjamin Netanyahu a majority of about 63 seats in the 120-member Knesset (parliament). Benjamin Netanyahu called early elections last October after his coalition failed to agree the annual budget. His joint party ticket has consistently led opinion polls, but recently lost support to a new ultra-nationalist party, Habayit Hayehudi (Jewish Home). Some 1,000 polling stations opened on Tuesday at 07:00 local time and will close at 22:00. About 5.66 million people are eligible to vote. For the first time the public is able to follow the counting of ballots in real time on a government website, Israel’s Haaretz newspaper reports. Final results are expected by Wednesday morning, after which coalition talks that could take several weeks will begin. Speaking at his final campaign appearance in Jerusalem on Monday, Benjamin Netanyahu said he was confident of a late surge in support. 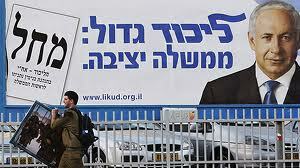 “I have no doubt that many, many people will decide at the last minute to come home to Likud-Yisrael Beitenu. Likud-Beitenu’s right-wing dominance has been challenged by Habayit Hayehudi, led by millionaire businessman Naftali Bennett – Benjamin Netanyahu’s former chief-of-staff. Naftali Bennett has advocated annexing large parts of the occupied West Bank and rejected the idea of a two-state solution to the Israel-Palestinian conflict. “I pray to God to give me the power to unite all of Israel and to restore Israel’s Jewish soul,” Naftali Bennett said on Monday during a campaign appearance at Jerusalem’s Western Wall. Habayit Hayehudi is forecast to take up to 14 seats and become the third-largest party in the Knesset. The second-largest party is expected to be Labour, which currently has eight seats but is predicted to make a comeback with about 17, due in large part to growing anger over the rising cost of living. Labour’s leader, Shelly Yachimovich, has ruled out joining a coalition led by Benjamin Netanyahu. The new secular centrist party, Yesh Atid (There is a Future), led by TV personality Yair Lapid, and centrist Hatnua (The Movement), led by former foreign minister Tzipi Livni, are also set to do moderately well. Both leaders have said they would consider joining a Netanyahu-led coalition.